During the process of freeze-drying our various fruit toppings only the moisture content disappears, their unique flavours stay in a concentrated form as does the valuable vitamins and minerals. The fruit toppings made this way do not contain added preservatives, sugar, artificial colouring or aromas, they are "original" and can give back their natural savours all year long, even when out of their season. 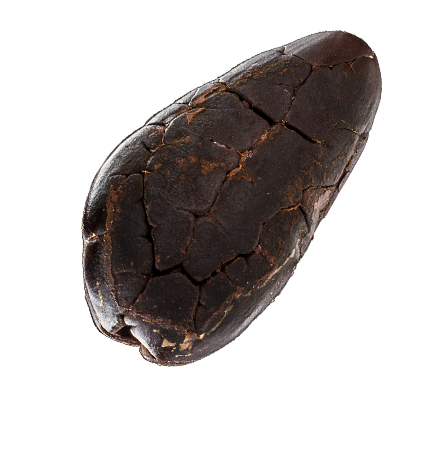 The wide array of assorted cocoa beans that make up the base of the chocolate has a lot of distinct natural aromas that can be brought to surface with the right spices. Spicy bitterness, exotic acrimony, and tender cinnamon-like creaminess - everything depends on the use of the right spices, which we pair up with toppings of the same characteristics. The fiber and protein rich oily seeds and the naturally lively freeze-dried fruits leave an intensive, lasting taste on any kind of chocolates. The softly crumbling fruits and the tenderly cracking nuts offer an unforgettable experience for your mouth. With the flowery chocolates we accomplish a gastronomic synaesthesia: we can smell the rose, the jasmine and the violet, complete with the toppings on the tongue they fill the mouth with natural, a bit sweet aromas. Fair warning: after tasting even one flowery chocolate creation we can develop a craving every time we see a bouquet. Chocolate and wine - by themselves they are exciting gastronomic products, each offering hundreds of aroma components to the taste buds. What happens if we combine them? We made such chocolate creations with the help of famous sommeliers that have similar taste patterns and can be paired with their respective wines to the benefit of both. When tasting we recommend following these steps: enjoy the visual pleasure that the handmade chocolate bar provides, look at the texture, sparkle and hue of the wine. Get to know the scents of wine and chocolate and each topping. Have a sip of wine followed by a little bit of chocolate, and give them a couple of seconds to melt and mingle in your mouth, before taking the next sip. Chocolate + peanuts. Or almonds. Classics. We could still make these toppings -rich in fiber, healthy and delicious - a unique experience through thoughtful combination and using the highest quality ingredients possible: hazelnuts from Piemonte regarded as the best in the world, or the pistachio from Bronte praised by star chefs everywhere. Coffee and chocolate are so familiar we could call them 'cousins'. They grow along similar geographic and climatic circumstances and their processing methods are also very much alike (roasting for example). So it's no surprise they go so well together. Nowadays the so-called 'pure' products are popular, 'pure Ethiopian' or 'pure Galapagos' etc. Alas different mixes of coffee from different plantations create great experiences as well, is they are assorted toward the end of flavour harmony. With the creation of the coffee collection of chocoMe our purpose was to introduce the rich palette of flavour down to every shade. As special in their look as in their flavour, our exclusive limited edition collection has festive motifs and one of a kind toppings. Shiny never been so delectable. The edible silver topping is a real rarity that can raise the value of even the most attentively made creations. Alas it doesn't have any scent or flavour, it can enchant the eyes with it's pure beauty. It doesn't affect the scent and taste of chocolate but we still cannot pass by the 23 karat gold flakes without a word. Imported straight from the Cradle of the Renaissance, we only decorate chocolate bars with this precious metal that has fitting colors.